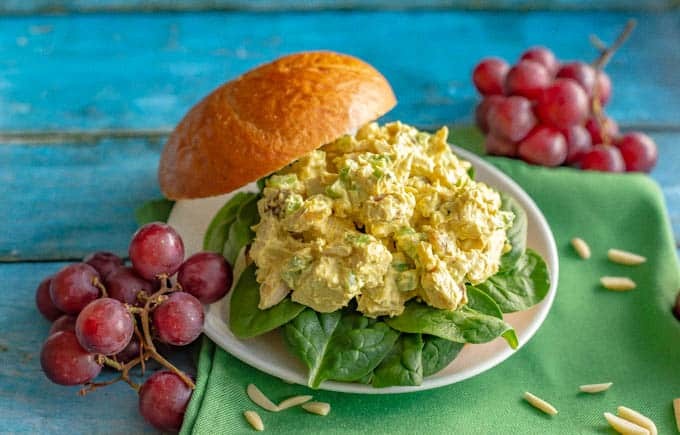 Healthy curry chicken salad is perfectly creamy with just the right level of spice and sweetness. 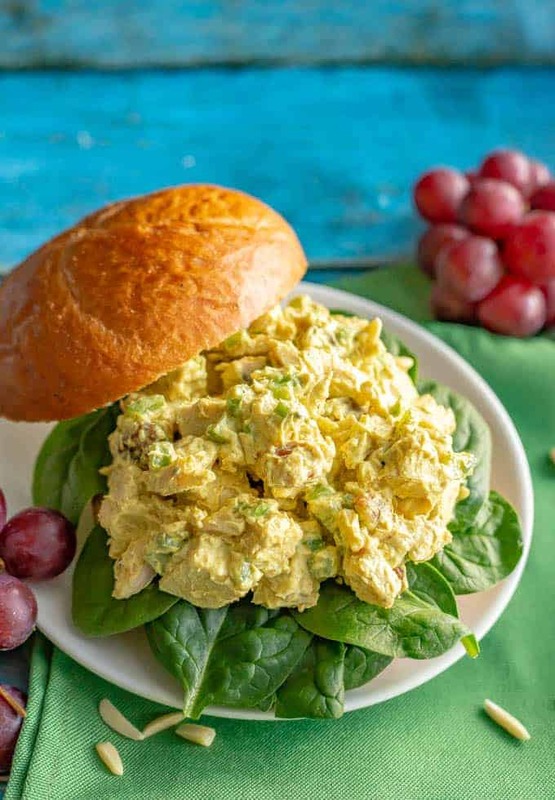 Serve as a sandwich, wrap, salad or with crackers for a delicious, healthy lunch! A quick hello from the beach! I’ve made curried egg salad, curried wild rice salad with raisins and pecans (served chilled) and curried brown rice salad, also served chilled. 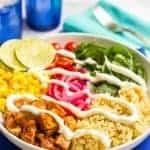 I also just shared my curried ground turkey and peas recipe, which is great for a quick and easy dinner with big flavor! I’m also a chicken salad fanatic. 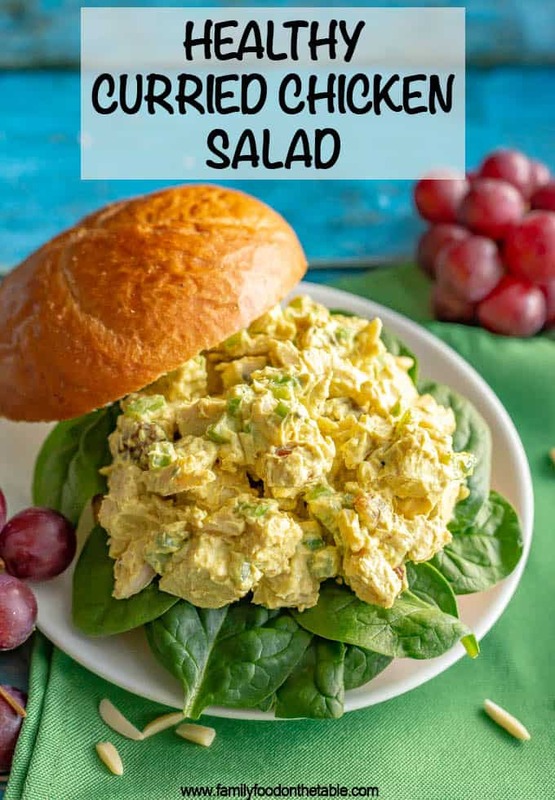 I grew up on my mom’s classic chicken salad (which I should really share here!) 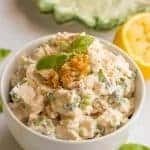 and I also love basil chicken salad with walnuts for a fun twist. 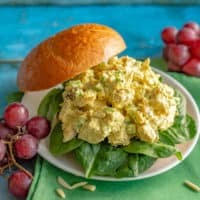 So of course it was only a matter of time before I brought you healthy curry chicken salad! This is one of those dishes that calls to me at delis, restaurants, even airport stands. But all too often, it’s just not quite right. Usually it’s way too creamy or overloaded with mayo. Or has too many add-ins. Or not enough curry flavor. Plus, I’m a bit of a control freak and I like knowing what’s going into my food. It’s also lightened up because I’m using part light mayonnaise and part nonfat Greek yogurt. They balance each other so well. This salad is everything I want come lunchtime. 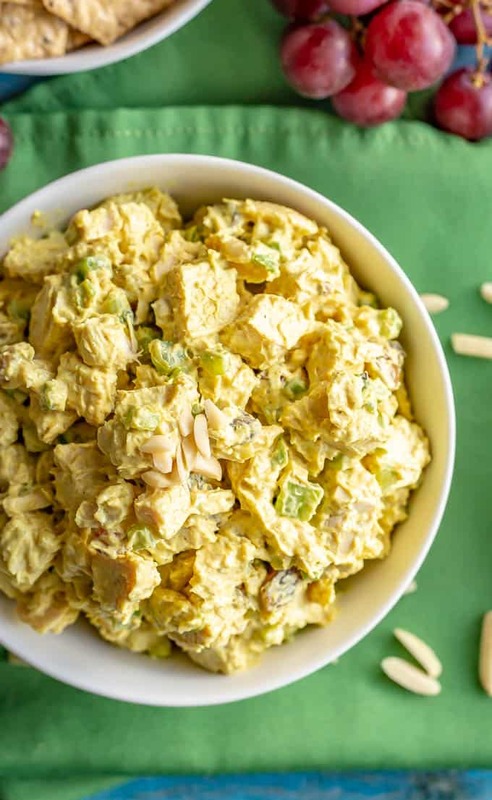 And I’ve got some substitutions and ideas for you on how to make it your perfect curried chicken salad too. If you’d rather just skip to the recipe, simply scroll right on through the rest of the text. The recipe card is near the bottom of the page, above the comments section. I prefer golden raisins, but regular raisins are fine here, too. The recipe calls for slivered almonds, but sliced almonds or chopped cashews would work as well. Finally, this is a great recipe to make ahead. The flavors blend and deepen as it sits. However, I recommend you hold off on adding the nuts until you’re ready to serve so they stay crunchy. 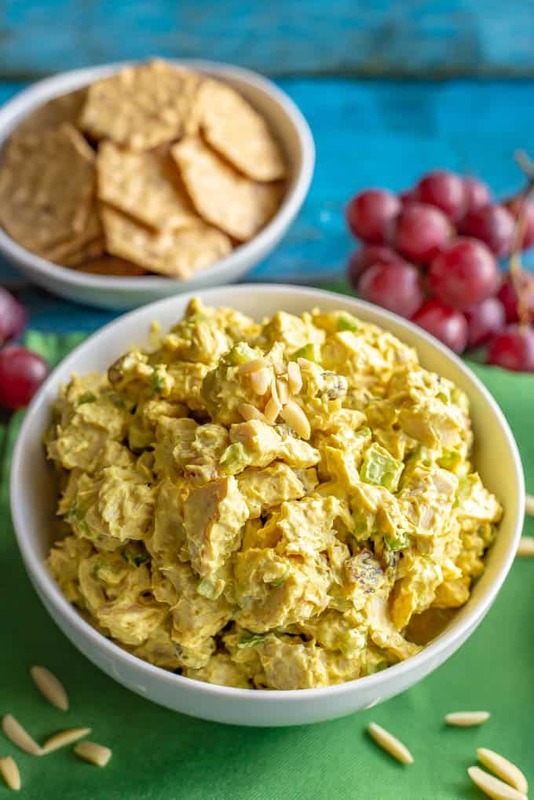 Want to make it a fruity curried chicken salad? 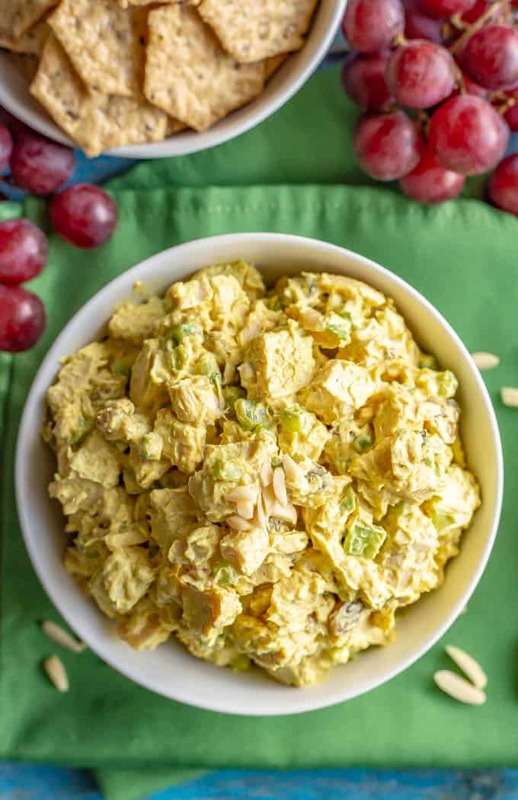 Apples and grapes are the go-to fruit additions for curried chicken salad. It’s all about your personal preference. You could add either 1/2 to 1 cup of chopped tart apple pieces, such as Granny Smith. Or you could add some halved red grapes for an extra bit of sweetness. So now, you’re ready to eat! We’ve got plenty of options here, too! – Make a sandwich with some lettuce and tomato and your favorite bread or bun. 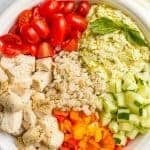 – Make a wrap or lettuce wrap using the chicken salad for a healthy lunch. 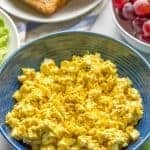 – Serve this with crackers and fruit for a snack or appetizer. 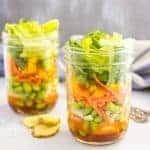 – Or enjoy this as a salad, piled over some mixed greens and veggies. – You can also serve this up in a hollowed out tomato or avocado for a pretty serving idea. 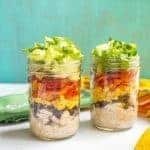 I hope you give this a try for a new healthy lunch. I think you’ll be as obsessed as I am! Bring a large pot of water to a boil. Add chicken breasts and cook for 30-40 minutes, until cooked through. Remove the chicken breasts, let cool, then chop into 1/4-inch size pieces. 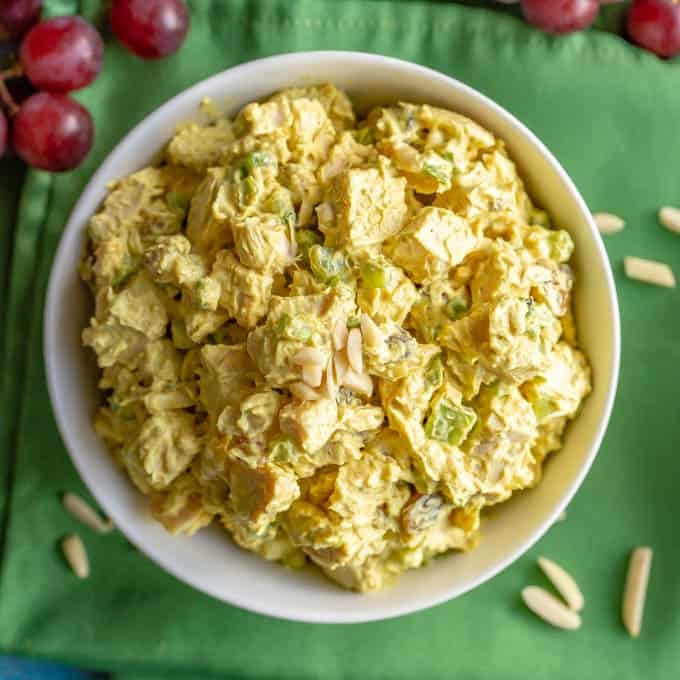 Combine the chopped chicken, celery, raisins and green onions in a large bowl. Add the Greek yogurt, starting with 1/3 cup, mayonnaise, lemon juice, curry powder, salt and pepper. Stir very well to combine. Add additional Greek yogurt, as needed, to get it to your desired level of creaminess. Cover and refrigerate for at least 30 minutes to let the flavors meld. Add the slivered almonds and stir to combine when ready to serve. Enjoy! I boil and chop some boneless, skinless chicken breasts for this recipe. You could also use chicken thighs if you love dark meat. Or you could substitute some rotisserie chicken to use in this recipe. Just go easy on the salt and adjust as needed.